BookBairn doing her best dinosaur roar with Emma Yarlett. Wow! We have been super busy over the last few weeks and I've been struggling to find time to blog. Apologies for the infrequency! Over the last few weeks though we have been doing some very exciting and bookish things (not to mention, changing BookBairn's nursery days, starting Baby Massage, Baby Yoga and Baby Sensory classes with the Wee Page Turner and my best friend got married!) and I thought it would be nice to share some of the things that we have been up to. August is always a great time to get in to bookish things where we live as it's festival time in Edinburgh which means the Edinburgh Book Festival comes to town - and so do fabulous authors and illustrators! First, The Wee Page Turner and I (BookBairn was at nursery) met Rob Biddulph in one of our local bookshops in St Andrews and has a wonderful time. Rob was brilliant with all the children that were there and had them in the palm of his hand as he showed them how to draw Kevin, a character from his newest book. After the story and drawing time we got a chance to chat and get our books signed which was very special. BookBairn loves it now - she says 'Rob drew a penguin for me!' every time we read Blown Away (review here). And I got one of our other books - Odd Dog Out - signed for The Wee Page Turner even though he is too little to really appreciate it yet. But mostly Rob was lovely! He gave me a warm hug and thanked me for loving and sharing his books and was just delightful! I hope the family enjoyed their time in St Andrews and ate up some of the delicious ice cream from our favourite ice cream shop and cafe. Later that week, The Wee Page Turner had his four month check (he's brilliant - big and ready for food!) and that means he got his Bookbug Bag! For those of you that don't know, in Scotland we have a brilliant scheme run by the Scottish Book Trust where children get four bags of books (usually three in each bag along with other goodies) by the time they are in Primary One. It's a fabulous programme and we have loved all the books that we got so far - BookBairn has had two bags as well. I think I'll write a full blog post on this at some point to review the books and goodies that we got most recently! The following day I had an evening child-free at the Edinburgh Book Festival to go to a workshop about Writing for Children. It was mostly for people interested in writing chapter books for children but I still picked up a few good tips! It certainly gave me the inspiration and motivation to start putting some of my ideas on paper, which is what I needed. Writing a children's book is something that I dream of but, quite honestly, it's really hard and takes a lot of time and talent to come up with a good story and I'm scared that I'm not good enough. But I really enjoyed the class and we had to do a little on-the-spot writing. So last week, I took a little bit of time away from the blog (sorry) to start writing and rhyming a children's story - of course, I only got part way through before nap time ended and I was interrupted but hopefully I'll find another snippet of time soon. But the best and most bookish thing that we did was last week when we went to see Dimbles's mummy at the Edinburgh Book Festival. 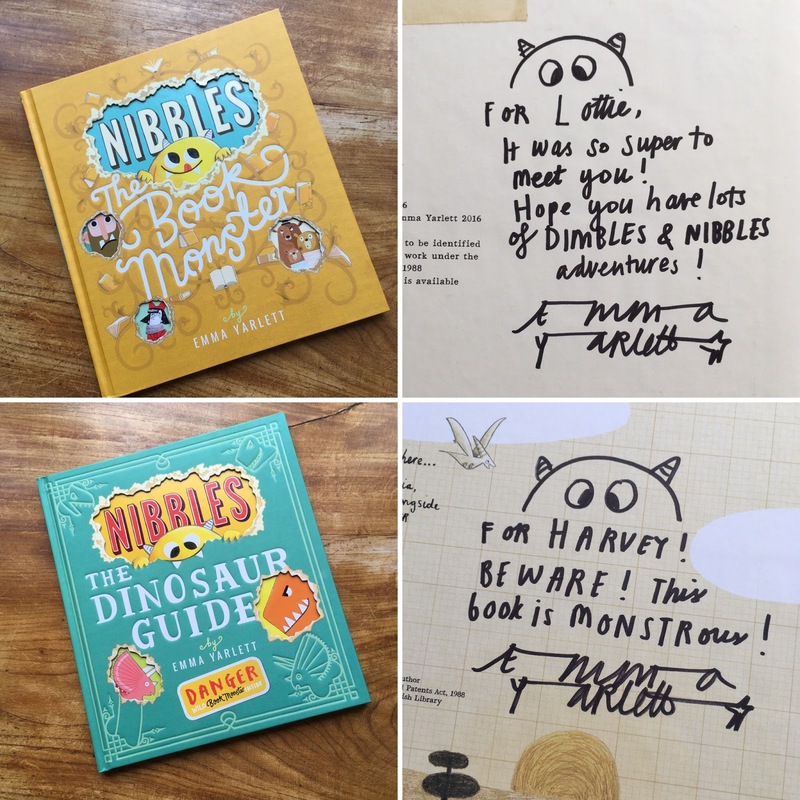 For anyone who has followed us for a while (and if you're new - hello), you will already know that BookBairn is a huge fan of Emma Yarlett's Nibbles the Book Monster. So when I saw that Emma was coming to Edinburgh I knew that I just had to take BookBairn for her first festival event! And she adored it! (A bit overtired from skipping her nap and distracted by a green balloon but she loved it!) Emma was brilliant and read the story making it interactive by having hidden pages from the book in the tent and asking children to spot where Nibbles had gone next (the teacher in me could see this as a great lesson starter) and then shared how to draw Nibbles as well as reading her new book about Nibbles Dinosaur Guide (review to come soon) and then finally helping all the children to make Nibbles head-gear! She also recognised us and came over to say hello which made me feel really valued and special. Thanks Emma. We got our books signed at the end and BookBairn was delighted. It was just one of the most wonderful parenting experiences that I have had so far - sharing something I love with her and enjoying ti with her. So, as I say, busy bookish weeks! We also squeezed in a trip to the library and over thirty new books in the post in that last fortnight too (many of which I am still to share as I've not had time yet - sorry I'm working on it). But that's why the blog has been quiet - because we have been busy! Thanks for reading along with us and enjoying bookish things as much as we do! Hopefully I'll fit in a bit more blogging in the next few weeks - I have lots of books I want to review and posts I want to write - it's just a case of finding the time (we also have two weddings and a holiday in September!). 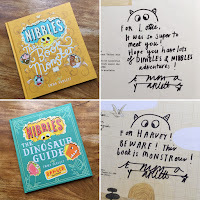 Good news amongst all the bookish things - we got an extra copy of Nibbles signed for one of our lucky readers! Lovely blog, you have been busy. Thirty books - I'm astounded b the rate of publishing in the picture book sector. It's vibrant, hugely creative and must be profitable or it wouldn't continue at such a pace. Together with that and such good schemes as Bookbug, early literacy is getting a great start. We are very lucky! But it's getting a bit out of hand! Haha! 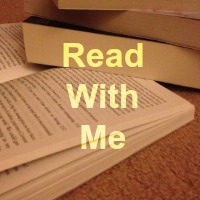 What a brilliant bookish time you've all had. BookBairn loves Nibbles the monster. I liked it when she called him Dimbles but those days seem to be gone. Is Nibbles a male? 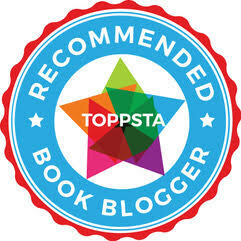 Great blog, MummyBookBairn. Keep up the good work. You have been busy haven't you?! My little ones favourite book at the moment is Hush-A-Buy Bunny by Holly Surplice. We got it from the library and she loved reading it that much at bedtime we brought our own copy. She knows it that well she does her own little actions to it. The cutest is on the line "I can hug away worries and kiss away tears" and she always comes in for a big kiss. That's a beautiful line! I'll need to look it up! That's a brilliant tale! Love it too! Thank you! I haven't picked up a pencil since though - been too busy! It's brilliant for bookworms like us! And yes I love it too! It's the best festival I've been too! All my favourite things in a wonderful city!